We make a great range of small double bedding including fitted sheets, mattress protectors and duvet covers. Our goal is to make sure having a smaller bed doesn't mean you can't dress it with luxurious fabrics! All our 4ft bed linen is made in house at our Lancashire factory. You can see nearly our entire range here on our online shop, including fitted sheets and mattress protectors. Our protectors are comfortable to sleep on whilst also protecting your bed, lengthening its lifespan. We also make small double duvet protectors and pillow protectors to give your bedding 100% protection. As well as 4ft bedding we also supply a wide range of accessories to match your décor or make your bed a more comfortable place to sleep. For example we offer full small double bedding sets complete with bedspreads and matching curtains; these are bespoke made from our wide range of jacquard fabrics. They give you everything you need for your bed in one handy click. We can mix and match fabrics to create whole bedroom looks with added cushions and bed throws; there is a huge amount to choose from! Even if you can't find a set or colour you like, don't worry. We have more available and can send samples if needed. We are standing by to answer any questions you may have such as the weight of different cotton thread counts and which would be better in summer or winter. Give us a ring! 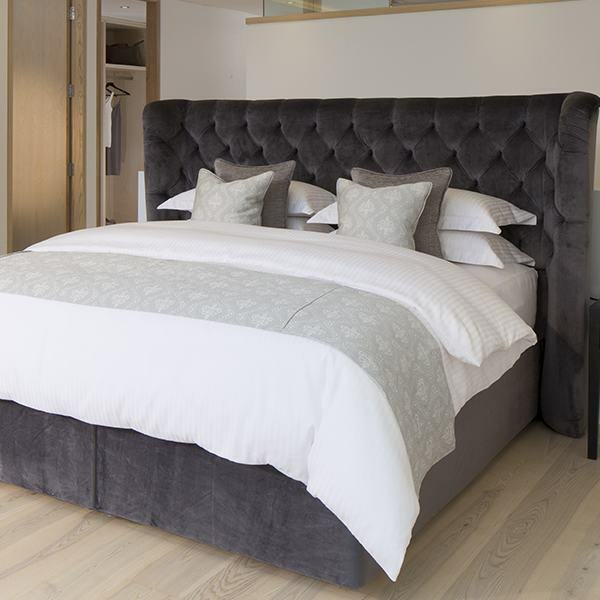 Our team of in-house, highly skilled seamstresses are ready to assist should your bed be slightly outside the usual sizes. Our customisation service means that we can take a set that you like and perfectly tailor it to your mattress – no more baggy sheets and untidy looking bedroom! Small Double Fitted Sheet in 540 Thread Count Satin Stripe, 100% CottonFitted Sheet to fit 4' x 6'3"..
Long Small Double Fitted Sheet in 540 Thread Count Satin Stripe, 100% CottonFitted Sheet to fit 4' x..
Small Double Bedding - Set ArleyLuxury bed set for 4ft bed in bright citrus colours, includes sateen..
Small Double Bedding Set - Bowden GreyLuxury 5 Piece Bed Set, bespoke made by Victoria LinenBespoke ..
Small Double Sheet Set - 100% Cotton4ft Fitted Sheet + Flat Sheet + 2 x Pillow Cases = 15% OffGet 20..
Fitted Sheet for Small Double bed in 100% Cotton - 1000 Thread Count Bed sheet for 4ft, 1..
4ft x 6ft 3" Fitted Sheet in 100% CottonFitted Sheets to fit 122 x 191cm Beds Perfectly. Relax on su..
Small Double Sheet Set122 x 191cm Bedding Set in 400 Thread Count Cotton.Luxury sateen finished 100%..
Small Double Sheet Set - 100% Cotton4ft x 6'6" Fitted Sheet + Flat Sheet + 2 x Pillow Cases = 15% Of..